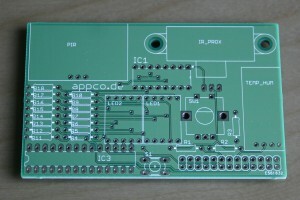 This week my 1st self designed PCBs arrived from eurocircuits.com. Below you see the frontside view, which is holding basically all components, more to that later. 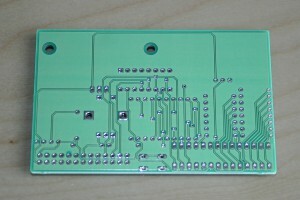 This is the PCB backside where actually only the 2X13 PIN connector goes in. 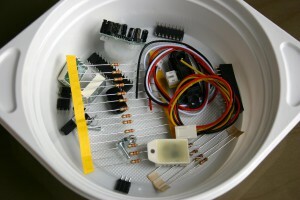 I used some one-way plastic soup bowls to assort the components for the three prototypes. 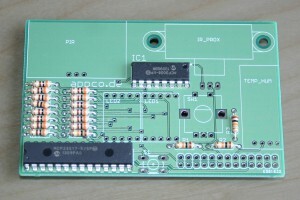 In the step below all resistors and the two ICs (MCP 3008 and MCP 23S17) have been soldered to the board. 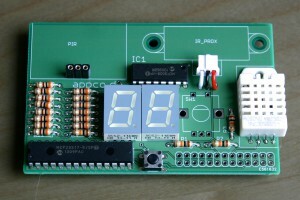 Almost there, connector for PIR and IR proximity added, DHT22 (Temperature & Humidity Sensor) and 7-segment displays added. Completely assembled it looks like this. To put it on the RaspberryPi I needed some extra tall stacking headers. 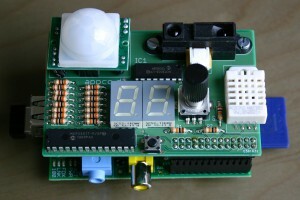 Finally, this is how the shield looks when it is added to the Raspberry Pi. I want the (still to be added) display only to be powered up when someone is within the range of the device to save some energy. For the implementation of this function I decided to start with an already assembled IR distance sensor from Sharp. 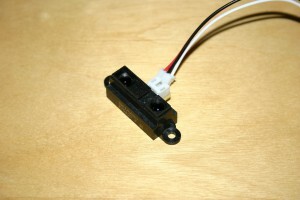 As this sensor is an analog sensor the analog voltage out will range from 3V when an object is only 10 cm away and 0.4V when the object is 80 cm away. 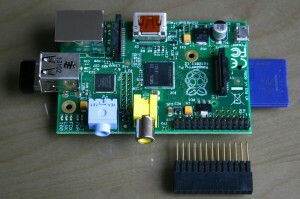 Unfortunately the Pi does not have any analog inputs. My rescue was the great post from Matt @ raspberry-spy.co.uk, where he explains how to measure different light levels on the Raspberry Pi. 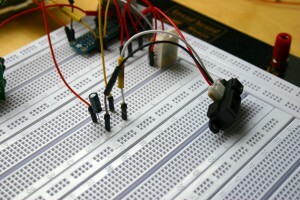 So I started from re-building his circuit and run some test measurements, this is how it looked on my breadboard. 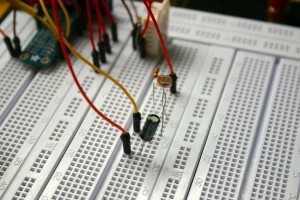 For a detailed overview including the Fritzing views please check out Matt’s post. 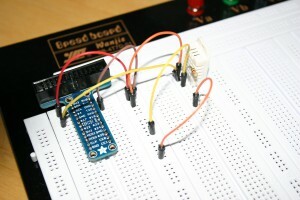 Once I had replicated this set-up successfully I added the IR distance sensor. With the following code I am able to count how many loops it takes until the capacitor voltage has increased enough to be considered as a HIGH by the GPIO pin (approximately 2V). The number of loops is proportional to the distance of an object in front of the sensor. At the moment the sensor is always powered on, which is probably wasting more energy than I am intending to save by the use of the sensor. 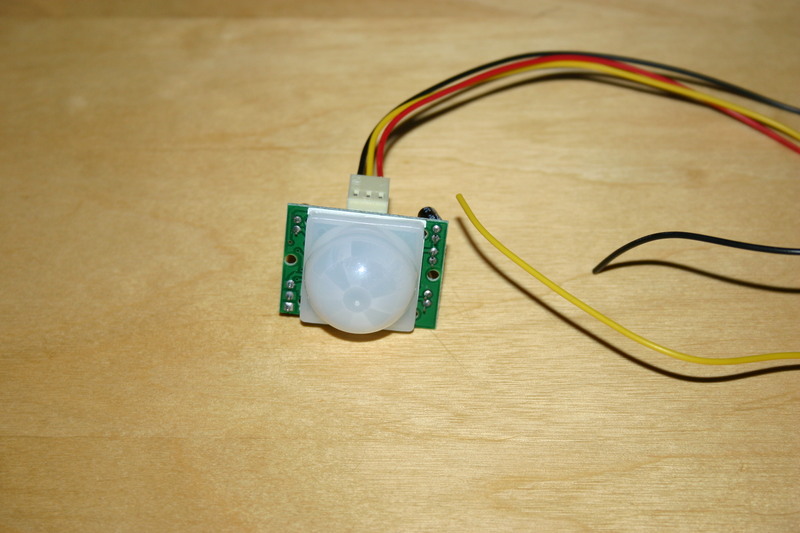 For the future the sensor should only be powered up when the PIR sensor detected a movement and I also want to replace the ootb sensor with a much cheaper solution made out of IR LEDs and an IR receiver. 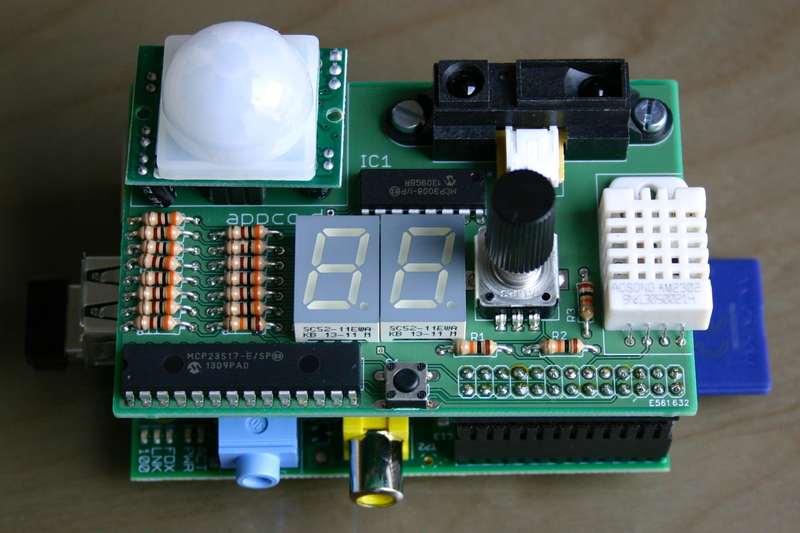 Inspired by the Nest® learning thermostat I want to improve the HomeAutomation capabilities of the Raspberry Pi by adding some sensors to enhance the functionality. 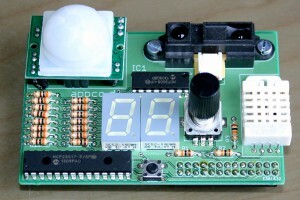 To measure the rooms temperature and humidity and to control the electrical valve accordingly. The reason to choose the sensor DHT22 over the DHT11, is the much higher precision. For example for temperature measures: ±0.5°C accuracy (DHT22) vs. ±2°C accuracy (DHT11). To my believe ±2°C is not acceptable for steering the temperature in a room. With this sensor the server should be able to detect a human being close to itself and enable interaction by making the user inteface available. For the time being I will work with the Sharp GP2Y0A21YK0F and may move to a DIY version later on.